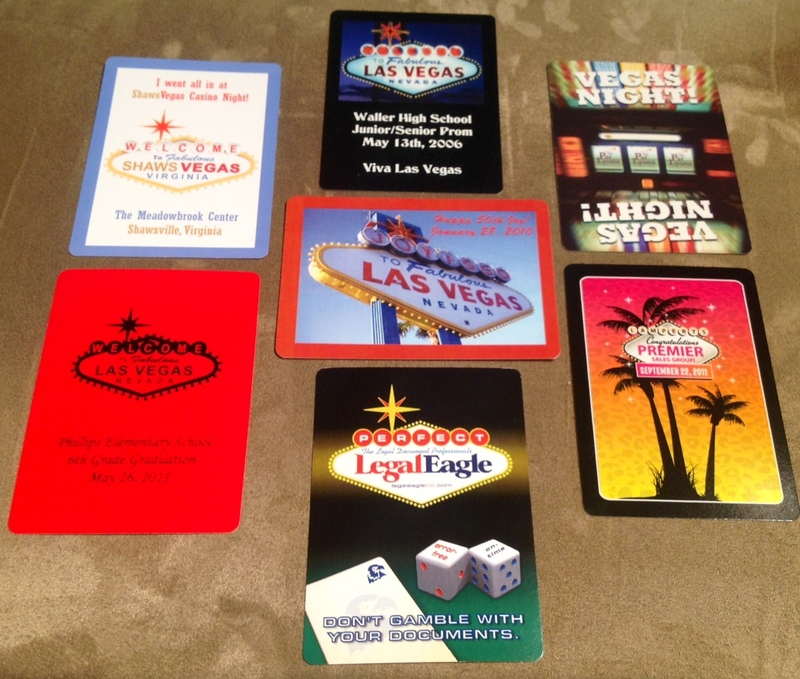 Personalized Playing Cards with a Las Vegas theme are popular for weddings – as you might imagine – but with the advent of so many world class trade shows taking place in Las Vegas – Custom Wedding Playing Cards are not the only playing cards we are printing with Las Vegas themes. Whether it is a photo of the famous Las Vegas Sign, a foil stamp imprint of the sign, a full color imprint with the sign customized to reflect the wedding or occasion, a photograrh of the city skyline or a graphic involving slot machines – Las Vegas Themed Playing Cards are taking off. The cards shown above were printed as follows: All of the above Las Vegas Playing Cards were printed on a digital press on casino quality 300 gsm playing card stock. The red card was foil stamped with a black hot stamp foil on a stock red poker sized playing card stock. Personalized foil stamp playing cards require art work that reproduces well in black and white so that a precision hot stamp die can be created which transfers the imprint through the foil to the card. The foil imprint is permanently adhered to the card stock through the use of intense heat and pressure. The formulation of the foil used as well as the adhesive have been time tested to assure complete compatibility so that the foil imprint bites permanently in to the stock and makes an imprint that will last for decades.